Thank you for your consideration of our real estate appraisal services in Temecula, CA. Brian Ward Appraisal is a real estate appraisal company with broad experience appraising houses, condominiums, manufactured homes, and residential land in Temecula's various neighborhoods. Our focus is on helping people who need appraisals for divorce, bankruptcy, estates, trusts, immigration, when buying or selling, and many other matters not related to acquiring a mortgage, although we also prepare mortgage appraisals. Our appraisal valuation services are diligently and specifically prepared for their intended purpose and audience; whether that is person or family member who may be unfamiliar with real estate, the Riverside County courts, the assessor, the IRS, other real estate professionals, or any number of other users and uses. Please call us anytime at (951) 309-2131 for a confidential and no-pressure conversation about your need and how we can help you. Why Order a Real Estate Appraisal in Temecula From Us? We produce QUALITY Temecula real estate appraisal reports with detailed and descriptive analysis that is defensible and able to stand up to scrutiny. Competitive rates, flexible scheduling, and fast delivery in Temecula, CA. Your appraisal report will be completed by a licensed / certified real estate appraiser with a MINIMUM of 5,000 appraisals worth of experience. No trainees or other support staff will work on your appraisal. 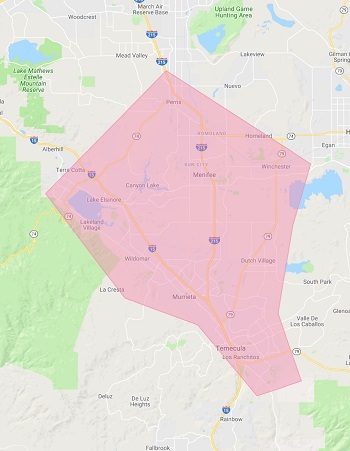 Our pledge that we will not accept your Temecula appraisal order if we do not think that we can produce a credible valuation to satisfy your need. Expert witness, consultation, and other dispute support with a track-record of the courts siding overwhelminhly siding with our analyses. More than 14 years of individual experience appraising properties in Temecula and the surrounding cities in Riverside and San Diego Counties.